Just marvelous! Happy Easter, Robert. Thank you Dave! Happy Easter to you as well. Great capture! 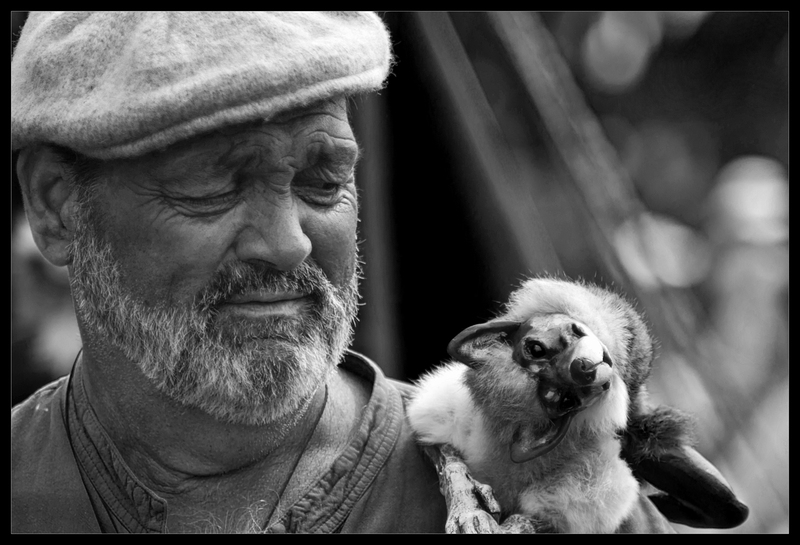 Love B&W people photos and the animal (whatever it is) is oh so adorable! So cute. Obviously the animal is loved whatever it is. Thank you Mary Lou! Happy Easter to you as well! Good shot… especially in BxW. this is a terrific photo–it has it all! so entertaining. Thanks Lance. I liked both of their expressions! It’s “Wonder”! 😉 I like your photos, “My fire breathing brother” was some very cool shots! Thanks, I didn’t take those. He had a show in Puerto Rico. I couldn’t go. He is a very entertaining guy to have in the family. Is it a raccoon? A bat? I figure it out. Great double portrait! Love it. What the devil is that? A large bat? Great shot! Definitely not a bat! Great blog, your b&w work is excellent! Adorble! My guess is a baby wolf? You’re very close, but I’ll still never tell! 🙂 Thank you for your comment, Milkay! This guy has such an expressive face, you could spend days photographing him and never tiring of it. Agreed, Dave. I was pleased this shot came out like this. This one showed his expression the best, in my opinion. Haha, crazy looking something there. this amazing “…..” animal 🙂 I think I know him so I left “the wonder” as you meant… You did a wonderful photograph… But this animal is amazing too… like a dog… like a cat… It is not a usual one… am I right? Sorry for such a late response to this comment, Nia! I’ve been neglecting this page, apparently! Thank you for not saying and leaving it up to everyone’s imagination! 🙂 I think you may be correct in your thoughts though! Very interesting shot…wish I could figure out what animal that is! Thank you, Ambre! Sorry for the mega-delayed response, I don’t know how I missed your message! Once had one much like him and he was always entertaining, particularly in a crowd. Very cool! I was thinking about getting one also but got caught up in taking photographs! The cursed life of a photographer. 🙂 Thank you for your visit, your blog is excellent! and what about this shot? Very nice! What about it? 🙂 Thank you for your comment!